Gerhard Zandberg, who stands a towering 6’8″ tall, won 2 medals at South Africa’s National Championships after losing a bet. Junya Koga broke his own Asian Record in the men’s 50 back semis in 22.81. Christopher Reid didn’t score at NCAAs, but made up for that with an Olympic berth from the South African Olympic Trials. Felipe Franca and Nicholas Santos (pictured) each won their respective strokes as Brazil dominated the 2015 Raia Rapida sprint meet in front of a home crowd. The final team has announced its roster for the Raia Rapida format meet in Brazil, with South Africa tabbing Roland Schoeman & co. for its four-person team. Myles Brown has certainly made a statement at the 2015 South African Nationals, adding his fourth individual title of the meet. Cameron Van der Burgh, Gerhard Zandberg, Giulio Zorzi and Shaun Harris have thrown down the gauntlet: they are challenging YOU to beat their medley relay in the Movember Relay Challenge. Who’s up for it? South Africa’s World Record-holding and Olympic champion breaststroker Cameron van der Burgh has a challenge for you – and your mustache. The Brazilians dominated the 2014 Raia Rapida meet, winning 3 of 5 events and placing runner-up in another. 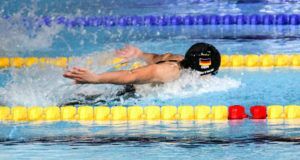 South Africa had a breakthrough with two swimmers qualifying for the Commonwealth Games in the 200 fly on the meet’s first day.